Note: You can enter this giveaway two (2) times per e-mail address per day. Deadline is 11:59PM ET 6.13.19. Whether you’re planning a holiday breakfast buffet or just have a bunch of hungry mouths in the morning, the Cuisinart Long Slot Artisan Bread Toaster will come to the rescue. 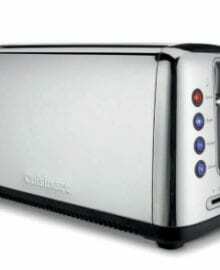 The toaster accommodates a variety of shapes and sizes of bread even those thick artisan breads you love. It features six shade settings to make everyone’s perfect toast to go with Fried Potato and Eggs. Plus, there are settings for Defrost, Reheat, Toast, and one for Bagels – that’s a good a reason as any to make homemade ones. With all the possibilities, you may just turn into a morning person after all. NO PURCHASE NECESSARY TO ENTER OR WIN. Void where prohibited by law. Open to legal residents of the 50 U.S., D.C. and Canada (excluding Quebec) who are at least eighteen years old at the time of entry and have internet access. Begins on 4.18.19 at 12:00:00 a.m. ET and ends on 6.13.19 at 11:59:59 p.m. ET. To enter the giveaway, submit your full name and email address on this form. Odds of winning this giveaway depend on the total number of eligible entries received. Only two (2) entries per email address per day. Sponsored by Leite’s Culinaria, Inc. For more information, visit our Official Rules. Be sure to add giveaways@leitesculinaria.com to ensure notification if you are the winner.